By Dan Ambrose: Golden Boy Promotions CEO Oscar De La Hoya says that the Floyd Mayweather Jr. vs. Manny Pacquiao last May turned off 2.5 million new boxing fans, who he feels will never come back to watch another boxing event due to De La Hoya believing that the Mayweather-Pacquiao fight failed to provide the action and excitement that it was originally billed as potentially supplying. For De La Hoya, it obviously hits him hard if the casual fans don’t come back to watch future pay-per-view fights, because he promotes a lot of fights, and it will be bad if the fan don’t come back. 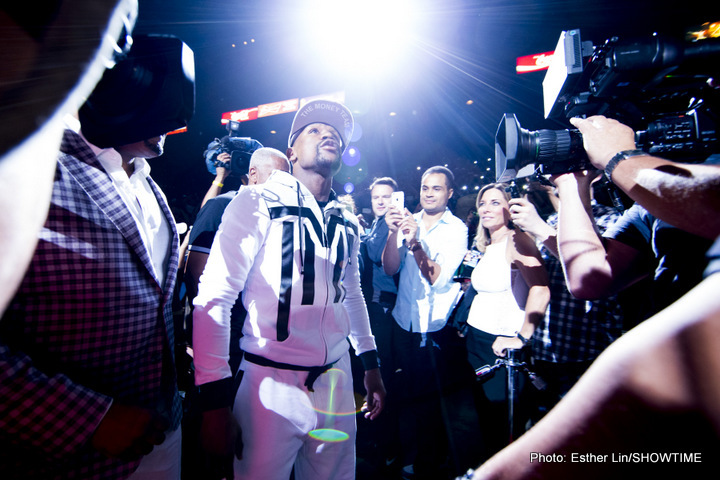 “Pacquiao-Mayweather didn’t live up to expectations whatsoever,” De La Hoya said to Fighthype.com. “You had 2.5 million people, new customers, disappointed. They wanted to see a fight, and now these are never going to want to see boxing again because of that fight. So that’s what I have a problem with. Now I’m speaking as a promoter. I love fights. I love action. I want to see an action fight. That’s what I’m going to see on November 21st [with Canelo vs. Cotto],” De La Hoya said. If De La Hoya really believes that the Mayweather vs. Pacquiao fight turned away fans due to it being a bad product, then De La Hoya should have never matched Canelo against guys like James Kirkland, Alfredo Angulo, Erislandy Lara and Austin Trout. Those fights were either terrible mismatches, or boring affairs. I saw all of those fights, and I really disappointed in all of them. Canelo-Kirkland fight was an exciting one for as long as it lasted, but it was a mismatch the moment the contracts were signed for the fight. It wasn’t a competitive fight, and neither were Canelo’s fights against Angulo, Shane Mosley, Matthew Hatton, Kermit Cintron, Josesito Lopez, and Alfonso Gomez. Those were all terrible mismatches. If De La Hoya wants to make sure that the boxing fans keep coming back, then he needs to do his part by him stopping with the mismatches for Canelo. There was no reason for Canelo to fight the likes of Angulo, Kirkland, Matthew Hatton, Cintron, Gomez and Mosley. Why hasn’t De La Hoya matched Canelo with Demetrius Andrade or Jermall Charlo. I consider those two guys very good fighters at 154, and certainly a lot better than the guys that Canelo has been matched up against recently by De La Hoya. Mayweather v. Pacquiao could have been a thrilling fight if Pacquiao wasn’t injured the way he was before the fight, but because of the injury he couldn’t fight as hard as he wanted to.